In American and Canadian football, a punt is a kick performed by dropping the ball from the hands and then kicking the ball before it hits the ground. The most common use of this tactic is to punt the ball downfield to the opposing team, usually on the final down, with the hope of giving the receiving team a field position that is more advantageous to the kicking team when possession changes. 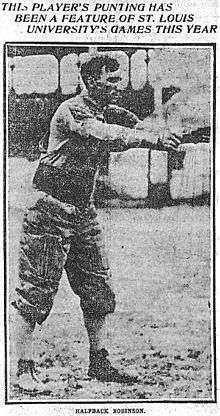 Alex Moffat invented the spiral punt, as opposed end-over-end. In football, the offense has a limited number of downs, or plays, in which to move the ball at least ten yards. The team in possession of the ball will typically punt the ball to the opposing team when they are on their final down (fourth down in American football, third down in Canadian football), do not want to risk a turnover on downs by not gaining enough yardage to make a first down and are in such a field position that they do not believe they can successfully make a field goal. The purpose of the punt is for the team in possession, or "kicking team", to move the ball as far as possible towards the opponent's end zone; this maximizes the distance the receiving team must advance the ball in order to score a touchdown upon taking possession. a ball which is allowed to land comes to rest in-bounds without being touched. 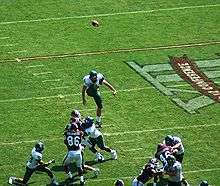 A touchback may be called if the kicked ball enters the receiving team's end zone without first touching any player, whether in flight or on a bounce; or if the receiving team catches the ball in its own end zone and downs it before advancing the ball out of the end zone; or if the ball enters then exits the end zone behind the goal line. (In high school football, the ball automatically becomes dead when it crosses the goal line and cannot be returned out of the end zone.) The receiving team gets the ball at its own 25-yard line. The net punting yardage is taken by calculating the total punting yardage and subtracting any yardage earned by the receiving team on returns, and subtracting 25 yards for each touchback. Conversely, teams may line up in a normal offensive formation and have the quarterback perform a pooch punt, also known as a quick kick. This usually happens in situations where the offense is in a 4th and long situation in their opponent's territory, but are too close to the end zone for a traditional punt and (depending on weather conditions) too far for a field goal try. Like fake punt attempts, these are rarely tried, although Randall Cunningham, Tom Brady, and Ben Roethlisberger have successfully executed pooch punts in the modern NFL era. Some pooch punts occur on third down and long situations in American football to fool the defense which is not prepared to return a punt on third down. Shane Lechler holds the NFL record for career punting average at 47.29 yards per punt (855 punts for 40,429 yards) over the 2000 - 2010 seasons. A punt return is one of the receiving team's options to respond to a punt. A player positioned about 35–45 yards from the line of scrimmage will attempt to catch or pick up the ball after it is punted by the opposing team's punter. He then attempts to carry the ball as far as possible back in the direction of the line of scrimmage, without being tackled or running out of bounds. He may also lateral the ball to teammates in order to keep the play alive should he expect to be tackled or go out of bounds. DeSean Jackson of the Philadelphia Eagles is the only player, in the "Miracle at the New Meadowlands", to return a punt for a touchdown on the final play of a NFL game for a win from scrimmage. The NFL record holder for the number of punt returns for a touchdown in a career is Devin Hester, currently of the Baltimore Ravens, with 11. ↑ "NFL Punting Leaders (All Time)". PlayerFilter.com. ↑ Joe Theismann NFL & AFL Statistics. pro-football-reference.com. Pro Football Reference. ↑ UPI (September 30, 1985). Bears Show Redskins a Team on the Rise. Lodi News-Sentinel, p. 17. ↑ Frank, Reuben (December 19, 2010). "Miracle at the Meadowlands III: Eagles 38, Giants 31". CSN Philly. Retrieved 2010-12-19.